Elsa and Anna are ready to get to the bottom of things when the peace of the kingdom of Arendelle is threatened. A wild animal loose in the village and destruction in the nearby Arendelle woods causes Queen Elsa to miss an important meeting with a neighboring monarch and she sends Princess Anna in her place. When Anna learns that this particular king will only speak to her sister, she begins to question her role in the kingdom. But when she learns that the king's daughter, the adventurous Princess Mari, is frustrated--with her father's overprotective ways--and would dearly love to find something purposeful to do, Anna is incredibly keen to help Mari to find a job that fits her perfectly! So as both princesses explore the variety of occupations that the kingdom has to offer, Elsa must address the problem in Arendelle's forest with Mari's father--who happens to be the unknowing source of the trouble! Elsa, Anna, and Mari will join together to resolve the confusion over the woodland and to find a purpose for Mari that she will love and her father will find fitting for his cherished daughter. 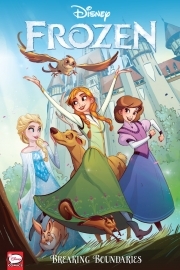 The continuing story of Arendelle's sister rulers, Elsa and Anna, is chock full of snow flurries of fun and unfrosted heart with writer Joe Caramagna (DuckTales, Zootopia, Avengers Assemble) and art by Kawaii Creative Studio from the Frozen film graphic novel adaptation.